This half term began with pancake day. We wrote instructions about how to make a pancake before making and tasting them. Yum! 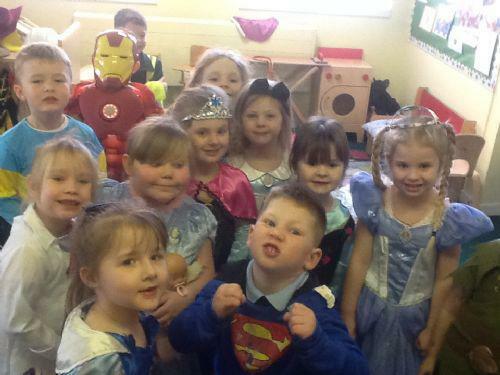 We then had our World Book Day Celebration in which we dressed up as our favourite story character and brought in our favourite book. We read lots of stories and did lots of reading activities. After completing our Dinosaur topic about extinction we were very excited to move our focus to the 'living eggs' that arrived in school. We waited two days for the chicks to begin hatching in the incubator. Four girl and six boy chicks hatched to our amazement and we enjoyed caring for them over the following week and doing lots of chick related activities including making a hatching chick and writing about the chick life-cycle. The chicks led us nicely into our Easter learning. Here is a photo of our Easter show and tell things. We also planted beans following our reading of Jasper's beanstalk and Jack and the Beanstalk. In maths we compared numbers to 20, practised addition and subtraction, explored pairs of numbers that make 5,6,7,8 and 10 (number bonds), looked at coins and their values, told the time to o'clock and described positions including using left and right. 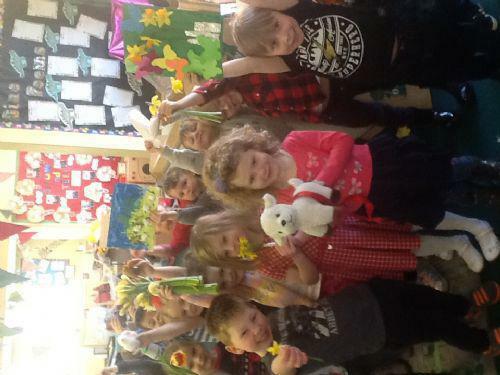 In literacy we listened to lots of stories relating to Dinosaurs, Chicks, Spring and Easter to a wide range of stories. We wrote about the stories Farmer Duck story by Martin Waddell and the traditional tale Jack and the Beanstalk. We also wrote instructions for making pancakes and about the life-cycle of a chick once we had sequenced the pictures correctly. We also explored nouns, verbs and describing words in our Rainbow Grammar sessions. In PE we travelled in different ways over apparatus using our balancing skills. We also practised moving in different ways e.g. skipping and galloping. We performed dance movements to match the life-cycle of a chick. We continued our Growth Mindset learning about challenge and perseverance. We discussed how a seed needs to persevere and overcome lots of obstacles as it grows just like we need to persevere with things that we find difficult. We also spent a lot of time this term discussing how to keep healthy by keeping active, sleeping and making healthy food choices. What a busy and enjoyable term we have had!